I've had a couple questions lately concerning the frequency response of our "brick wall" bandpass filters. I took time this morning to generate the response curves specifically for Receive for modes OTHER THAN FM (things are done a little differently for FM). Bandpass filter response is a function of two settings: (1) choice of window function (BH-4 or BH-7) and (2) choice of DSP Buffer Size (1024 / 2048 / 4096 / 8192 /16384). 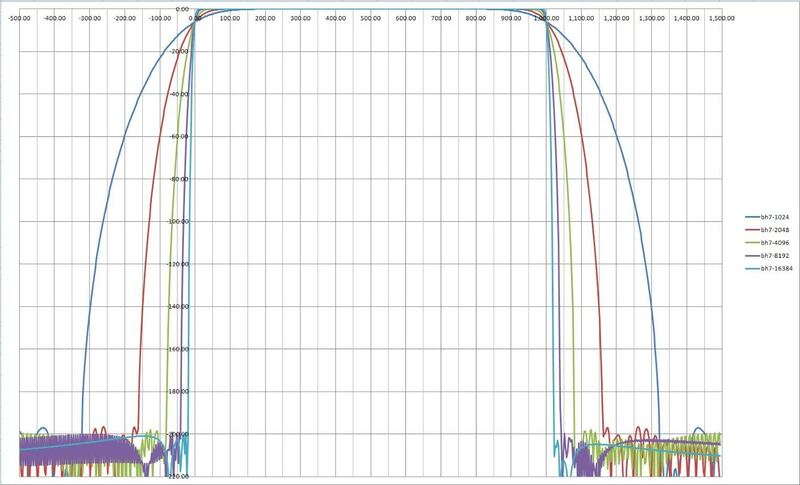 Bandpass filter response is also a function of internal DSP sample rate but that is fixed at 48K for Receive/non-FM in current openHPSDR PowerSDR releases. I've generated two plots, one for the five buffer sizes using the BH-4 window, and the other for the five buffer sizes using the BH-7 window. The plots are attached to this message. For the BH-4 window, initial rejection (at first side lobe) is ~-110dB and ultimate rejection is ~-140dB. For the BH-7 window, initial and final rejection are ~-200dB. The advantage of the BH-4 window is slightly sharper cutoff for a given buffer size. The advantage of the BH-7 window is the depth of the final cutoff. Note that I've arbitrarily chosen a 0Hz to 1000Hz bandpass. 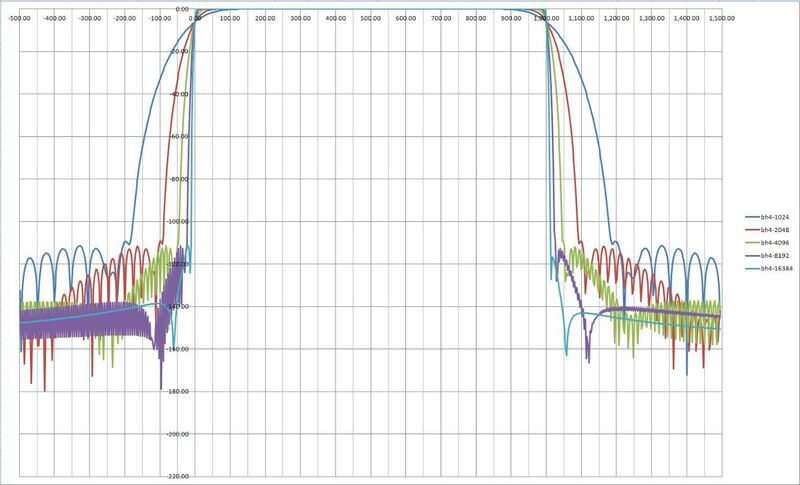 No matter what the bandpass selection, the filter "skirts", i.e., the transition and from the passband to cutoff, will have exactly the same shape and width, they would just shift in frequency with a different bandpassselection. So, these curves completely define the filter response. Note also that the upper transition region is just a mirror image of thelower transition region. You may note that doubling the buffer size halves the width of the transition region (skirt). The specified frequencies (in this case, 0Hz and 1000Hz) are the -6dB frequencies, by design. The responses shown were generated directly from the software contained in the WDSP dsp library in the 3.2.27 release of openHPSDR PowerSDR.